John Bonham is one of the legends of rock ‘n’ roll, and his drumming style helped to elevate Led Zeppelin to greatness. 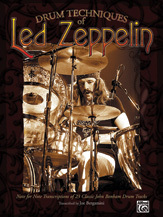 This revised edition contains 23 of Bonham’s most famous drum transcriptions from his work with the legendary Led Zeppelin. Also included are editor’s notes from each record and note-for-note transcriptions. Titles include: Good Times, Bad Times * Babe I’m Gonna Leave You * Dazed and Confused * Communication Breakdown * Whole Lotta Love * Heartbreaker * Living Loving Maid (She’s Just a Woman) * Immigrant Song * Black Dog * Stairway to Heaven * Misty Mountain Hop * The Song Remains the Same * Over the Hills and Far Away * The Crunge * D’yer Mak’er * No Quarter * Achilles Last Stand * Nobody’s Fault but Mine * Fool in the Rain.